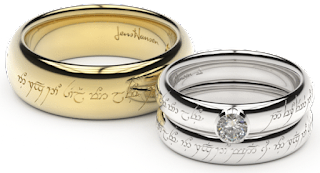 Iarwain Ben-adar (Sindarin: ‘Old Fatherless’), known more commonly to the Buckland hobbits as Tom Bombadil, was the eldest of all speaking-peoples in Middle-earth. Throughout the Second and Third Ages of Middle-earth, he dwelt in the Old Forest east of the Shire with his companion, Goldberry (the 'River Daughter'). 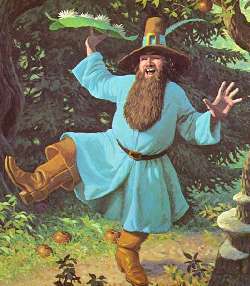 From all evidence, it appears that Bombadil was a unique being, though his exact race is unknown. He resembled a Man, short and red-faced. He wore bright yellow boots and a pointed hat with a blue feather. The Elves deemed him “oldest and fatherless,” and the Eldar, who had known him in the First Age, acknowledged him as the oldest of all creatures. He even referred to himself as the Eldest. Bombadil’s history too is unknown, save for small revelations he offered to guests. With the shrinking of the woods of the Elder Days, Bombadil retreated and took up a new abode in the Old Forest, where he eventually became known to hobbits. He had absolute power over the Old Forest, and not even the One Ring had any effect on him. To the Dwarves, he was Forn, and in legends of the Northern Men he was Orald (‘very old’).